Congratulations to the winner Paul and runners up Allan & Jimmy. The typist has been given her jotters for typing words that weren't actually there, namely "this year". Some diseases are infectious and some are contagious – that’s medical fact - but never in his wildest dreams did your scribe think that accidents are infectious. Last week Jimmy appeared with a plaster on his forehead the result of walking into a door. (So he said but we suspect differently!) This week the entire Kilmarnock contingent arrived with plasters on their foreheads. Jimmy has yet to see the joke. 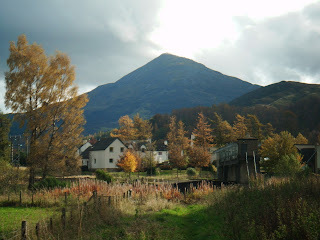 The plan for the day was to have a walk near Cumnock taking in the old mining village of Skares. This was so that Paul, our junior football expert, could see where the famous Skares Bluebell FC once played. 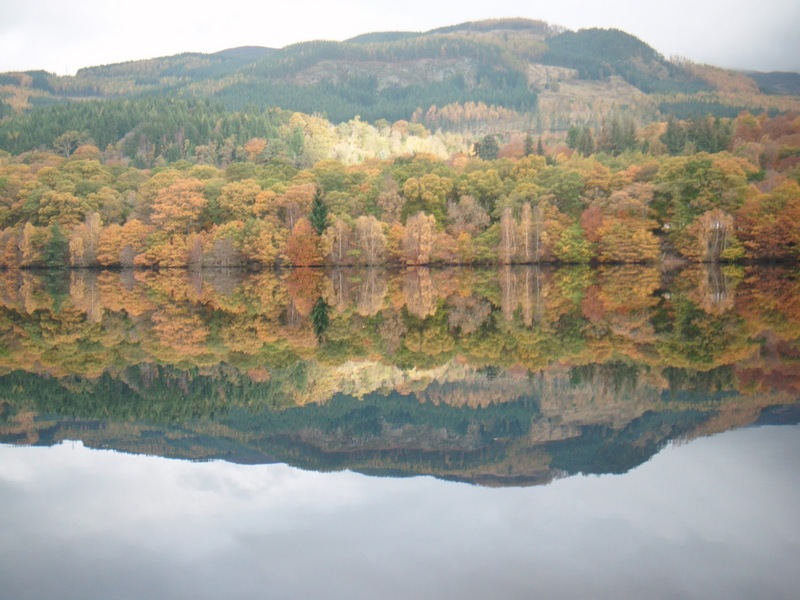 But the weather, as it has been many times this year, was dull, damp and dreich with the threat of rain anytime. 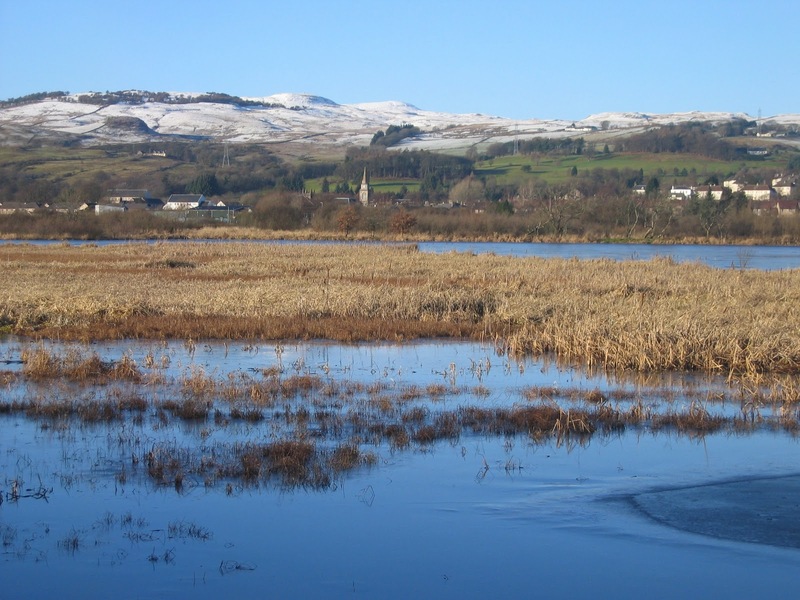 When we gathered in Jimmy’s place in Cumnock a change of mind was in the offing; we would abandon the Skares idea in favour of a mid-winter saunter down the River Lugar from Cumnock to Ochiltree. This itself was a straightforward affair and one we have done often before (6/01/2010, 2/02/2011 inter alia) so merits no further description here. Only one or two details should be reported for the sake of the record. The first was a diversion to Dumfries House, not so much for the house itself but for the tearoom there. Because this is the festive season we decided to treat ourselves to an indoor cup of coffee. The waitresses were delighted to see us for they had had nobody in this morning before us and reckoned that they would have nobody for the rest of the day. We were a pleasant distraction from the boredom of doing nothing – at least we were some sort of distraction. A nice half hour over coffee (and Malcolm’s macaroon bar) and we were on our way again. The next stop was at the Barony ‘A’ Frame. Those who knew that there was only enough seating there for six and who could count that there were nine of us, sped up the track to get the benefit. 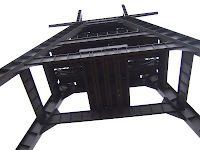 The three slowcoaches had lunch standing up while the rest enjoyed what comfort a perforated metal bench afforded. 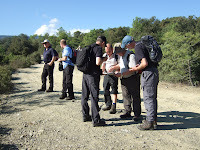 Lunch was followed by a quick tour of the information boards then we headed back down the track to the river again. A rather unpleasant incident occurred beyond Mill Affleck. The tail-enders - who incidentally had just been listening to a rather Johnny-like rant from Jimmy – came across a dog in some distress. It was one of those ‘Staffie’ type of devil-dugs and it appeared to have something stuck in its mouth. While it was happy to be clapped, it would not let any one of us – well Jimmy, the dug whisperer, anyway – near its blood spattered mouth. A few minutes later a young woman with another of the same type of dug came back along the path. She had been walking along talking on her phone and never even noticed the dog was missing. While the dug whisperer held the other on a lead, the woman bent down, opened the jaws of the distressed devil dug and prized the offending stick from between its teeth. Relieved of its torment now, the devil-dug was a calm and docile as any pet. 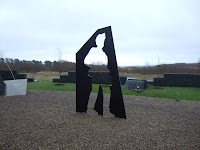 The woman and her twa dugs kept us company to Ochiltree. We took the bus back to Cumnock where the Sun provided festive FRT. A special mention should be made of Karen, the barmaid in The Sun who patiently suffered all our festive banter and returned it with a smile. Thanks Karen. Mulled wine notwithstanding, we travelled into the city, parking on Kirklees Place, just behind the Botanic Gardens. The walk was to be one that we have done a few times before (17 December 2008, 16 December 2009 et al). 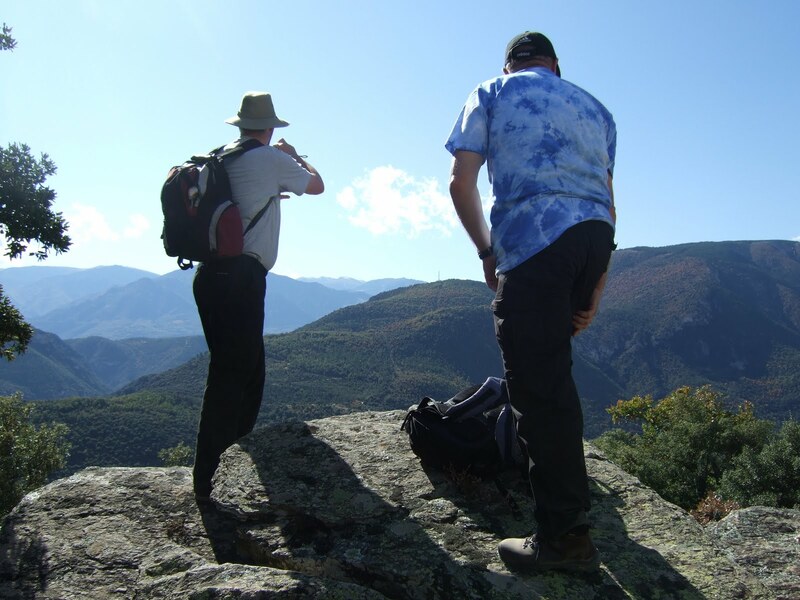 While some of us thought that we would make a change and do the walk in the reverse direction from the others, Robert and Rex set off in the usual direction. Despite the overwhelming feeling for the opposite direction, they strode on, oblivious to our gently persuasive comment. We followed, still commenting on the two disappearing down the hill. The walk was to be in the usual direction. Suitably refreshed, we made the move to return. But Davie Mc said that it was too early for the return for lunch was booked for two o’clock. He suggested a slight extension to Port Dundas and the end of the spur. 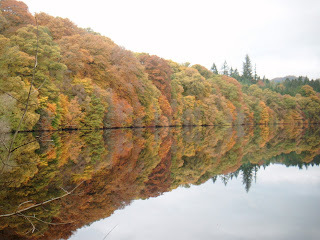 Though it wasn’t the most interesting part of the canal, it did add some time onto the walk and by the time we had returned to Speirs Wharf, it was indeed time to make the return journey. We came back to Maryhill Road and left the banks of the canal. Then by cutting the corner we came to Queen Margaret Drive and back to the Botanics. The answers are all places that at least some Ooters have been to [this year - NOT this year. The typist has been sacked]; obviously I cannot guarantee that everybody has visited all the places in the answers. 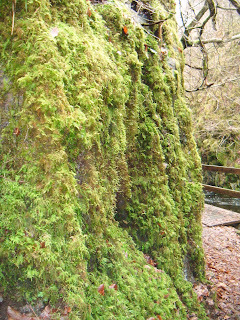 Remember, of course, that not all walks have been en Ecosse! Some of the solutions are rather obtuse to try and outwit smartarse Jimmy. Odd man out. Which of the following do not belong? Dungrain Law, Hill of Stake, Blackcraig, Goatfell, Blacksidend. Ballochmartin, Ballikillet, Auchenhessnane, Breakough, Figgantoch. Rankinston, Galston, Annbank, Tarbolton, Catrine. Col de Jau, Ness Glen, Cairntable, Clyde Valley. 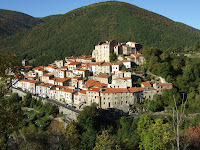 Manteaux de Sel, Nouveaux Moulins, Château de Lait, Beau Zizi. Any reasonable answers for the above will be considered, and then totally discarded and ignored in favour of the correct one which is mine! Ubi coitus sumus? 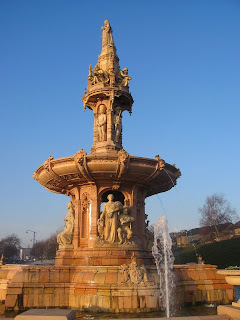 Where were the following pictures taken? I'll put up a bottle of wine as the prize. In the event of a tie, I have a deciding question. (not my photo, by the way!). Kay & Davie were there too - this is the sandy path to Barassie beach. We didn't last long! Alan, Allan, Andy, Davie C, Davie Mc, Ian, Jimmy, Johnny, John K, Malcolm, Paul, Peter, Rex, Robert & Ronnie. The rain drummed on the roof of Alan’s conservatory and rattled, wind driven, against the windows while we sat in the warmth, contentedly availing ourselves of Allan’s hospitality – bridge rolls with sausages, coffee and biscuits. It was nice to have Ronnie back with us as well after his medical problems and there was a bit of catching up to do here. The crack was good and the food was good and were reluctant to move. But then, are we not a walking group? Are we bothered by a wee bit of weather? The answer to that is probably ‘yes’ for we have seen enough of it this year, enough to last us for a few years to come. 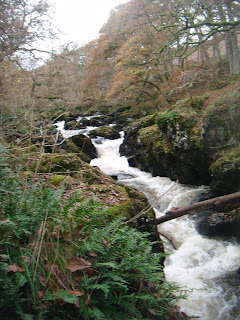 But there came a lull in the torrent and, as the rain went off, we set off into the breeze. The walk was a straightforward, low level affair the first part of which was new territory to most of us and we looked forward to seeing a different part of the country. We set off on a tarmaced path round Annanhill golf course to an old estate house called Mount House. ‘Turned into flats now’, said Allan when we asked. We considered this an excellent way of preserving these old buildings. And we had a good look at it as we came round it to find the old drive which we followed out to what used to be the Dundonald road before the bypass was built. We came under the bypass and followed the old road to where it met the new section from Dundonald Road. Now Alan offered us a choice; we could go down to the river – the Irvine – and follow it or keep to the road to Gatehead. Given the rains of yesterday it was felt that to go to the river would present us with problems; the water would be high and the ground saturated. The consensus was to keep to tarmac. 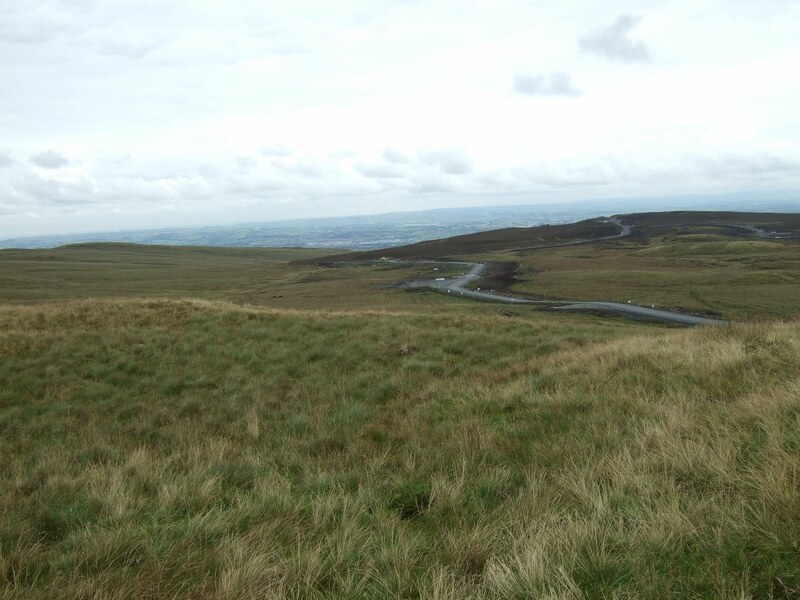 So we crossed the busy road and headed for Gatehead. 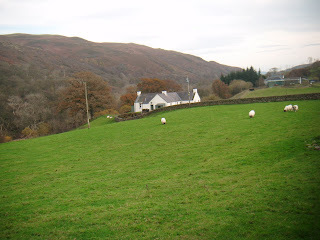 In Gatehead, at the Cochrane Inn, we turned right off the busier road onto a quieter country road. At least we though this wee road would be quieter but it was surprisingly busy and we had to step aside more than once to let traffic past before we came to Laigh Milton Mill. Coffee was called at the old mill. The old mill, not so long ago a fine dining place, is pretty derelict now; the windows are boarded up and the walls need some TLC; graffiti covers the boarded windows and litter covers the ground. The remains of the mill wheel stick out of the ground showing where the mill lade once came from the river but even this artefact is in need of attention before it is lost forever. And this was the place we chose to have coffee. Some sat, some stood and some nosied around the mill. That we were right to avoid the riverside today was apparent here. The Irvine, full of yesterday’s rain and the melting snows of Monday, ran fast and deep and brown over the mill weir, lapping near the top of its rubble-reinforced bank. It would have been silly to come that way today. With coffee finished, we continued along the narrow road, coming on to the B7081 near Thorntoun Estate. Here we turned left for Springside. In Springside we turned left on to Overtoun Road to find the Kilmarnock to Irvine cycle track along the old railway. We were now back in familiar territory. Once on the cycle track we had only four miles back to Killie. Only two things of note happened on these four miles: The first was the spotting of a large flock of swans, seventy plus, and an equal number of geese in a field to our right – whooper swans and pink-footed geese according to our expert: The second was to be caught in one of those squally showers that swept the country during our walk. We managed to get some shelter from the worst of the downpour under a bridge over the old railway track and avoid a soaking. 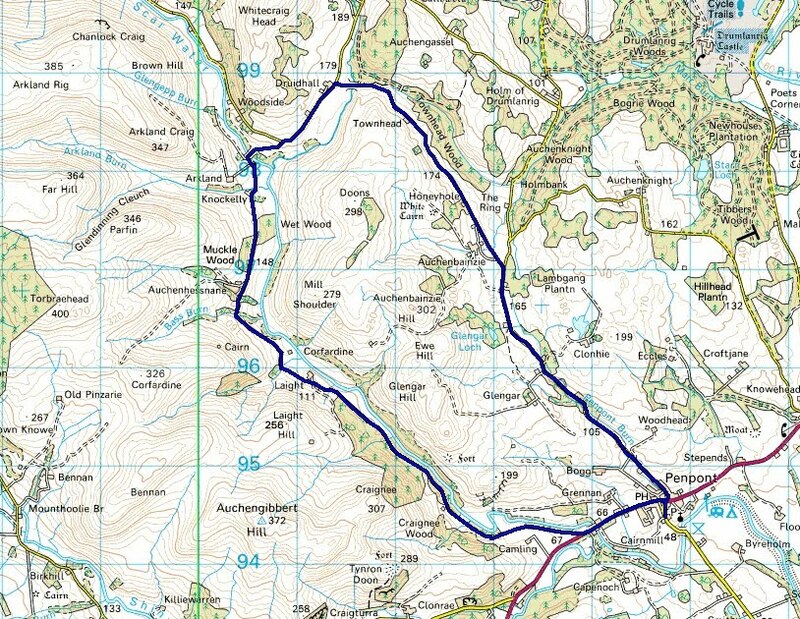 Then it was a straightforward stroll/walk/march* back to Kilmarnock. We were caught in another shower just before we arrived at Alan’s place and, though the rain stung into the face, it lasted no length of time at all and was gone by the time we arrived at Alan’s. # It was noted that some had more than one bit of belter, one in particular had three bits. We know who you are! Given the weather of the last few days, especially yesterday when the monsoon hit, it is something of a minor miracle that we got for a walk at all today. Still, the morning was dry and, despite the forecast for more heavy rain later today, we did get for a walk. Rex’s house was easy to find this morning for this being St. Andrew’s Day, a huge Saltire flew above his door. Despite his Aussie birth and upbringing, he has been here long enough to be a proud adopted Scot and was showing us how to celebrate our national day. But more of Rex’s celebrations later. The plan was to walk to the top of Brown Carrick from Rex’s place in Alloway but given the predicted early afternoon rain, the decision was made cut the walk short and drive down to the shore at Greenan. While most of us found the correct car park one, who shall remain anonymous to save his embarrassment but for the sake of identification we will call Vadie Mc, found himself alone in the park nearer the millennium brig. By the time he had walked the half mile or so to join us we were changed into walking gear and were champing at the bit for the off. 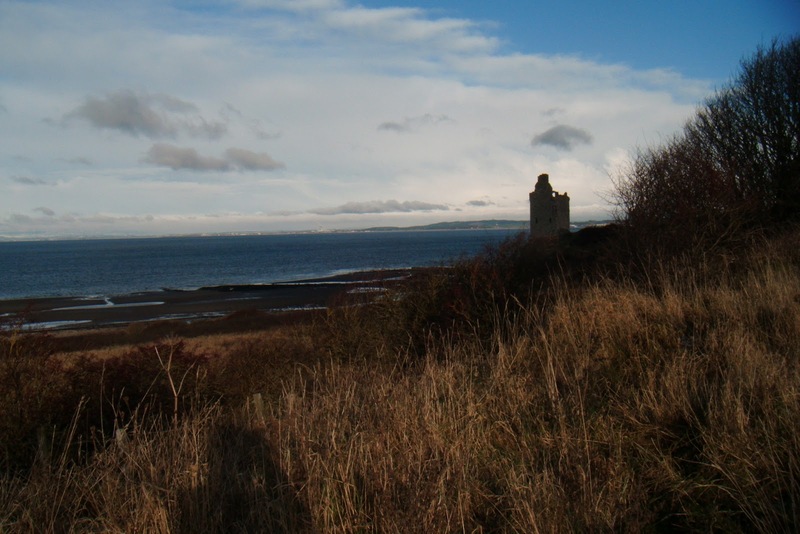 Weel happit against a snell south-easterly, we set off along the shore towards Greenan Castle. The tide was on the flow but there was still sufficient sand for us to make it round the rocks under the castle. Birds by the hundred searched the weed on the litter line and prodded the sand closer to the water; the birders were in heaven. A pair of swans took to the wing, skimming over our heads, as we approached Craig Tara Caravan Park. 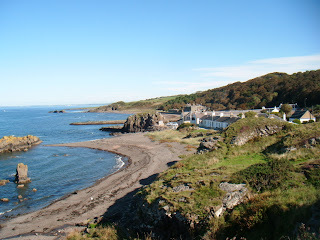 Now, we would normally turn up through the caravan park but Jimmy and Ian had a ‘better’ suggestion; we would follow the route that they found the last time we were here – 8 December last year - and avoid much of the busy Dunure road. We kept to the shore for a bit yet, turned in at the caravan park utility station and came on to its golf course. A friendly Yorkshire Terrier - is there really such a thing? – accompanied us across the golf course much to the frustration of its owner who stood and shouted long for it. Eventually we managed to chase it back towards her, but not until we had crossed the fairway to a gate on its far side. Now, with the dog heading back towards its owner, we came through the gate onto a steep and muddy track. So much for a ‘better’ route so far! The track took us up to what Ian called ‘the llama field’. This was the field where the llamas were last December but here were none this December, only big, brown sheep and pale grey donkeys. Despite much ‘shooing’, it was the donkeys that decided to accompany us now. But that problem was solved when we came to the ford on the far side of the paddock and they decided to turn back. But now we had a different problem. We bade farewell to Peter here for he had appointments to keep. 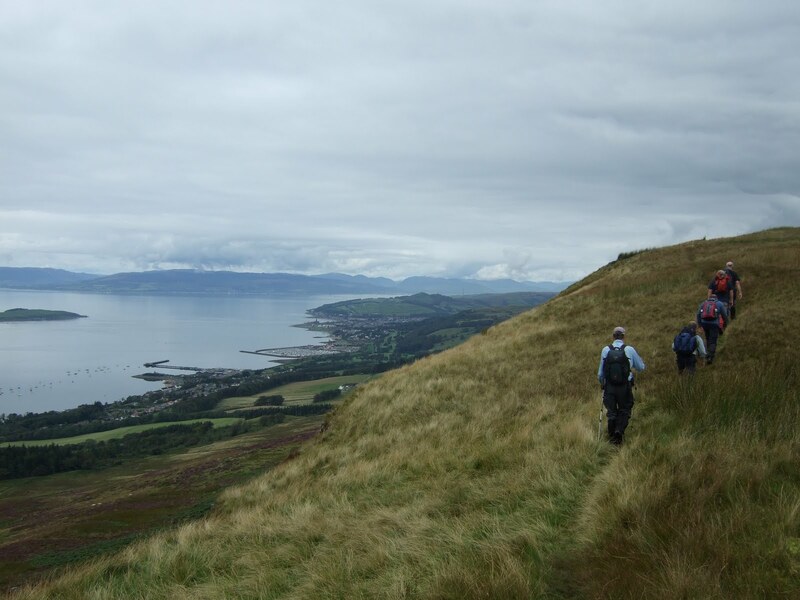 He turned back towards Greenan while we crossed the Dunure road and took the minor one for Carrick Hills. The climb of the road was a straightforward affair. We stopped on the lea of a bank for elevenses for the wind was now strengthening and we feared there would be little shelter further up the hill. And we were right. 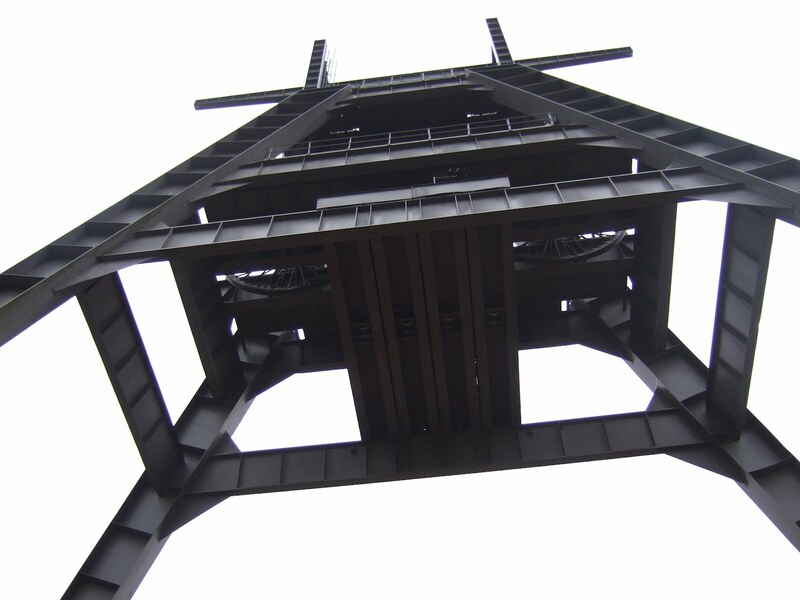 As we climbed, the wind grew fiercer. By the time we were on the final zigzags to the radio masts, we were battling into a ferocious gale, a gale that was proving tricky. On the zig it was in our faces threatening to push us back and on the zag it was on our backs hurrying us along. On the bends it was on the side threatening all sorts of other mischief. Yet, despite the wind, we all made it safely to the shelter of the shacks round the masts. And as a bonus, the rain had stayed away. But we were n’t finished at the radio masts. We now left tarmac and took to the open hill. Surprisingly, the hill wasn’t nearly as wet as we expected it to be and the footing was easy. Not so the wind though. 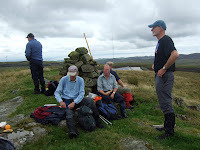 We butted into it across the open hill to the trig point marking the summit and stayed there just long enough for the record photo to be taken then turned tail and came back across the hill. With the wind on our backs, we made good time back to the shelter of the radio shacks. We lunched in the lea of the shacks. The descent of the road was quicker than the ascent, especially for Jimmy who couldn’t control himself and sped past everybody only to wait for us on the flatter ground near the main road. And we kept to tarmac this time, coming past Heads of Ayr Farm with its exotic Zebu cattle in the field and back to Craig Tara. This time we did come through the caravans and back to the shore. The tide was on the ebb again but was still pretty close to its high and some doubt we expressed as to whether we would be able to get round the rocks under Greenan Castle. These fears were increased when we had to climb and clamber down the first wee outcrop that we came to but they we allayed as we approached the castle and saw the extent of sand available to us. We would walk comfortably round. Past the castle then and with only a few hundred yards to the cars the first spots of rain hit. We had been lucky with the day despite the wind on top. For FRT today we repaired to Rex’s place where he had laid on not only the usual ale but, since it was St. Andrew's day, Scotch pies as well. Our thanks go to Rex for his hospitality. Next week we want fillet steaks. Hill of Stake, that mysterious top that lies on the Ayrshire-Renfrewshire border, a top that we have tried and for various reasons have failed to find, remains a mystery. The plan to walk there and prove for once and for all that it really does exist was abandoned today again for the weather forecast was anything but good and we have had enough of walking in the rain this year. So where to instead? After a bit of head scratching in the pub last week, we opted for a wet weather alternative of the Portencross circular. (See 5/01/2011 inter alia) So, four cars decanted eleven Ooters onto the car park at Portencross in North Ayrshire. The forecast was for rain arriving sometime during the morning but at the moment it was dry though overcast. It was dry yes, but a raw sea breeze kept the temperature down and we were glad to be walking to stir up the blood and raise the body heat. Most of us thought that we would be doing the usual circuit but Ian had other ideas. 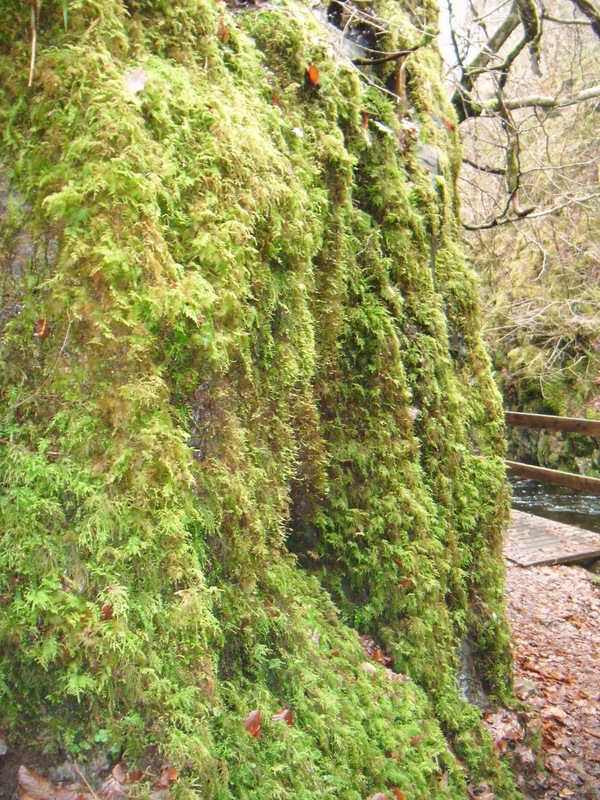 "Since we’re here and it’s dry at the moment, why don’t we climb Goldenberry and make the walk different?" His suggestion was accepted gladly, even by those with an aversion to climbing, for we have done this circuit so many times that we welcomed anything that would make it different. 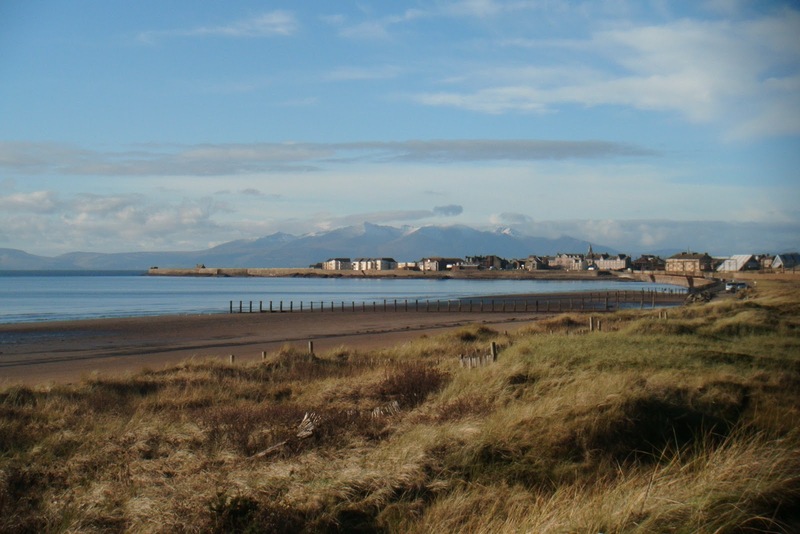 So we set off back towards West Kilbride. Robert spotted a path leading up the hill and proposed that as a route but the consensus was that this might be mucky and we should perhaps stick to the track through Ardneil Farm barely half mile further on. Eventually Johnny arrived and we could walk on. We might have stayed on that track and taken a direct route for the mast on top of Goldenberry but there was an interest in viewing the dun on top of Auld Hill, a top rising immediately on our left. This entailed coming through a field gate, rising slowly along the edge of a turnip field, through another gate, climbing steeply in a gap through the bracken and then more gently up the southern ridge of the rise. This sounds long and arduous but in fact it was easy, the distance to the top being nearly half a mile and the total rise somewhere around the eight hundred mark. And the effort was worthwhile. Why the ancients chose this point for their defensive farmstead was obvious as we took in the view from the top. Even on this dull day it was remarkable: from the heads of Ayr in the south to the hills of Cowal and Argyll in the north and from the hinterland of north Ayrshire to the islands of the Clyde and with the steep slope on one side and the cliffs of Portencross falling steeply to the village and its harbour on the other we could see why this was such a strong defensive position. To add to our enjoyment of this wee top, shafts of sun broke through the cloud spotlighting the firth and surrounding landscape. Those with an eye for such things tried to capture the scene with their cameras. 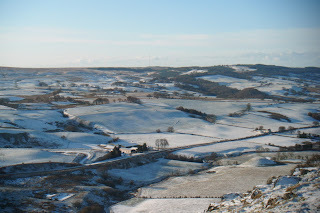 We left the dun, clambered down the steep slope to the north-east and carefully stepped over an electric fence into a stubble field that sloped gently up towards Goldenberry. Some kept to the top of the sea cliffs above Hunterston and others made a more direct route for the top. But, no matter which route was chosen, we all arrived at the mast on top at the same time. Here coffee was called and we settled down in the shelter of the mast buildings for a caffeine boost. After coffee some were for following the quad tracks towards Hunterston but Ian directed us in a more northerly and steeper line to find a track among the trees above the power station. 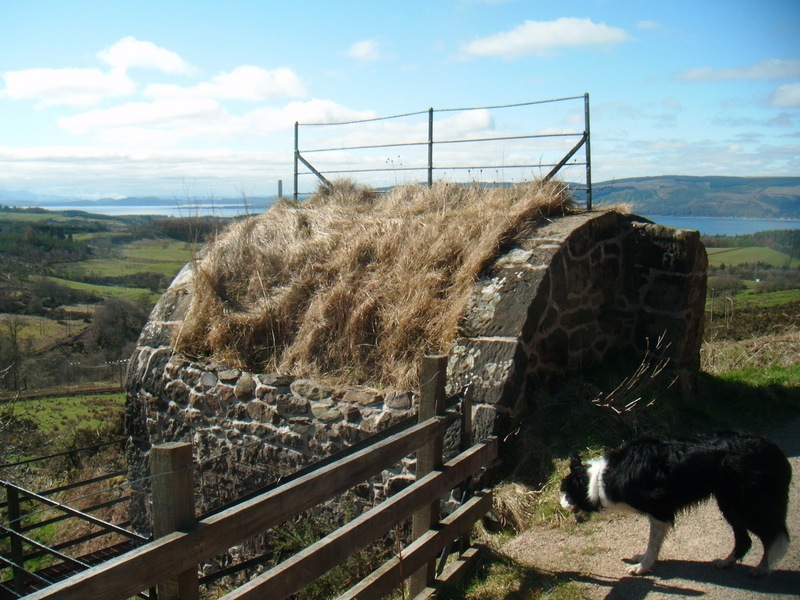 This track took us gently down to the tarmac at Hunterston Castle. 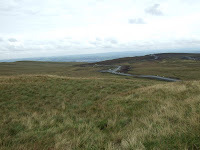 Now we were in very familiar territory and followed the tarmac to the power station road. 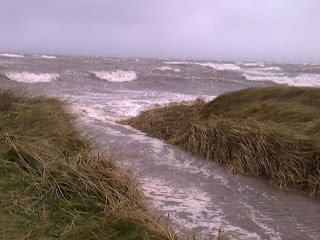 So far the rain had stayed away but the first spots were felt as we walked along the shore towards the power station. Rex and Robert, fearing that they might dissolve in the rain, picked up the pace leaving the birdwatchers little time for their observations. This was maybe just as well for the rain came seriously when we got to the power station. However, compassion compelled us to stand in the rain and wait for Ian who was seen to be sitting some hundred metres behind, but when we discovered that he was not medicating as we thought but just donning waterproof trousers, we were somewhat less than compassionate. Ian’s ears burned and we walked on into the steady dribble. Nearly back at Portencross we came across a motorist with a predicament. Somehow he had managed to squeeze his car between two boulders to get into the old pier but couldn’t quite negotiate his way back through on his exit. Despite the rain we stopped to offer our advice and assistance, even trying to move the boulders for him. But when it became obvious that it would take time and a great deal of shuffling back and forth and the rain was constant now, we left him and his mate to it and came back to our cars parked in a more sensible place. We can only hope that he is not still stuck there shuffling back and forth between the boulders. We will find out next time we are this way. Given the forecast, we had been lucky to get a dry walk at all. Yet, on the whole, the day was good, only marred by the rain on the way back. 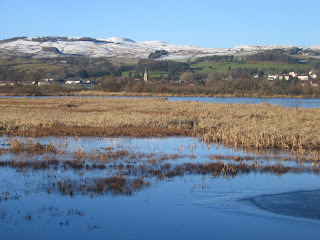 FRT was taken in the Laurieston, a place that is rapidly becoming our howf after walks in north Ayrshire. It was chucking it down as we arrived at the Visitors' Centre at Muirshiel for the proposed ascent of the Hill of Stake. Some of us had arrived on time but others i.e. the Kilmarnock car driven by Ian and navigated by Robert were late - not for the first time recently I may add. Having missed a turn off they managed to get bogged down in a verge – you couldn’t make it up! Given the weather, even the alternative lower level walk was out of the question given overhead and underfoot condition so we adjourned to the Visitors Centre at Castle Semple Loch to take stock. Coffee and buns were duly consumed and, before we got far too comfortable (and much too excited after having drooled over Johnny’s pictures of his foundations – and they can’t touch you for it! ), Robert, who else?, announced that we were going for a walk. Therefore at 10.55 we set off down the cycle path towards Kilbarchan. This brought back somewhat sore memories of the cycle to Pollok Park a couple of years ago – a trip maybe to be repeated in better weather. The rain had moderated by this time and was in our back anyway as we made good progress (guess who was in the front!) along the well maintained path. After about an hour it was decided that we should turn around and retrace our steps. Again progress was good even into the rain until Johnny decided, within sight of the Visitors Centre, that we should deviate from the high path and take the lower one beside the loch. Bad move! We were in and out of puddles (good one Jimmy!) for the quarter mile back to the cars arriving at 12.50. Use was made of the changing facilities in the Centre to get into dry clothes and we were made most welcome to bring our packed lunches inside. Every cloud…, as they say. Thanks to the staff there for being so hospitable! We got soaked running the 50yds back to cars for the short journey up to the pub on the corner. Here, Ian graciously presented Rex with the Mosset trophy. Rex, in bouleish mood, accepted in typical Aussie way by suggesting that it had been far too easy. 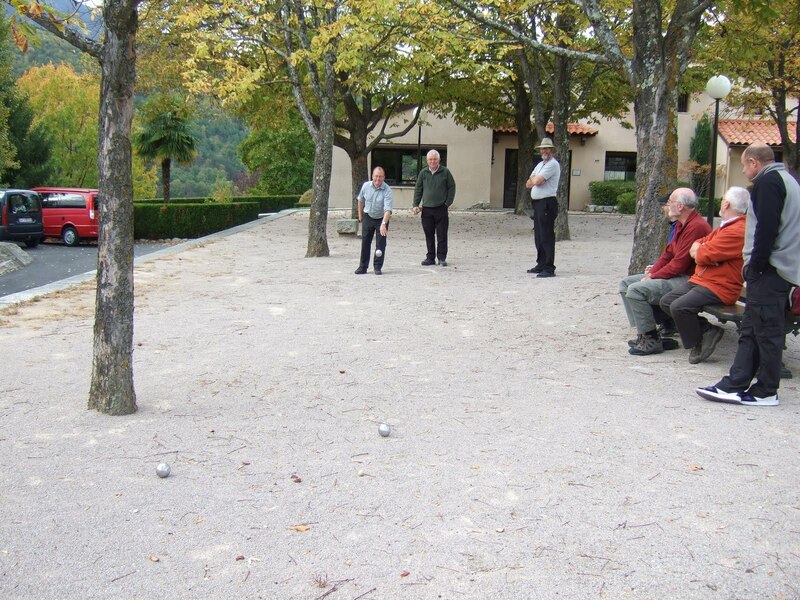 Next year there will be no Aussie rules boules – Johnny will make up the rules! This may be a first for the blog as the blogger was not on the walk. Who says the blog is a work of fiction anyway? Six ooters were reinforced by Eddie and Andy today. Davie, hearing of the shortage of regulars, sent 3/4. With the smell of bacon rolls wafting through Dundonald everybody made the meeting point at Malcolm’s and tucked into his (sorry, Anne’s) tasty treat. Ian Hill, noticing a surfeit of the rolls, had a second and allegedly stopped after that. What is the collective noun for bacon rolls anyway? Maybe we’ll just call it a malky. Suitably fed and watered, the expedition set off towards Troon following, at least most of the time, the Smugglers’ Trail. Robert, as usual, set a comfortable pace – who’s kidding who here? – and legend has it that by the time lunch was called for on Barassie beach, in lovely sunshine I may add, the distance from the first to last man was a mere 2km. After the trek along the beach to Irvine, a pit stop was made at the Ship Inn before returning to Dundonald by bus and car (Allan by this time had served his punishment and had been let out for the rest of the day). Further refreshments were taken at the Old Castle in Dundonald. For possibly the first time the beardies were outnumbered as we assembled at Prestwick for the annual Mosset trip. Seven of us had prebooked the former toilet area on the Ryanair flight and were strapped in standing up for the length of the journey. Not bad for an extra 50 euros each! Rex chose the first class option and had the outside toilet all to himself. 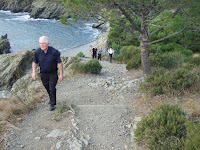 Soon we were at Girona and finding our way to the hired cars. The Kilmarnock/Ayr Fiat Doblo was soon on its way and should have been followed by the Irvine/Dundonald/Barassie VW Caddy but for the inability of the car to start. Paul tried umpteen times to get it going and was advised by Allan to depress the clutch before turning the key, but still no joy. Paul did say though that he found that the clutch had little travel on it - this should have been the clue. Eventually Paul and co-driver Malcolm went back to the office for assistance only to return and report that the car had a voice activated starting mechanism. Paul tried again as Johnny shouted in Fawltyesque fashion for the car to start. After a while with still no joy Paul admitted that this was a joke and that all he had to do was depress the clutch before starting. After failing miserably again Allan got out from the back, (not ea sy as the Caddy had only one rear door and it was not at Allan's side), went into the driver's seat and started the car first time. Paul and Malcolm were amazed. 'Let me try again,' said Paul. It was only after some more unsuccessful attempts and some helpful 'advice' from the rear did he realise that he had been pressing the brake all the time. However, to be fair, Paul and all the other drivers did us proud for the week. We stopped for a bite to eat at the Catalan Village then headed for Super U to stock up for the first couple of days. Robert made his famous sausages and lentil dish and the company settled down for a relaxing evening of wine, women and song - well one out of three ain't bad and, in case your wondering, the one came out of a bottle, well a box actually. By this time the rain was pouring down outside but thankfully this was the only occasion we were to see any real rain. 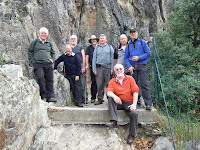 We awoke to a bright crisp day having decided that the opener should be the walk up to the Pic du Roussillon. The rain on the previous evening had fallen as snow on the mountain tops and made for some stunning scenery. 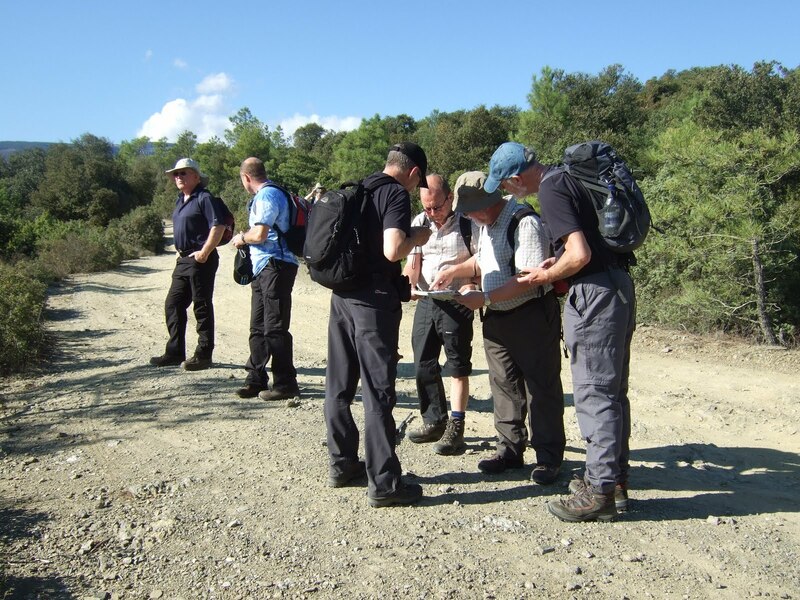 This is a well established walk and the sunny conditions made for good progress. The wind was chill though and our usual coffee stop was passed by in favour of the shelter of some rocks further up. As we took a short break, for the wind seemed to be hitting us no matter where we sat, griffon vultures soared effortlessly overhead. Some thought was given to sacrificing the two Mosset virgins in our midst but sense prevailed when they offered us money for their safe passage. 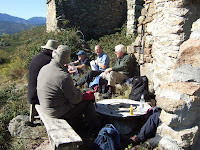 Next stop was at the shelter close to the road for lunch and here indeed we were sheltered and enjoyed a lazy half hour basking in the sun befor e striding up the road towards the summit. Allan, Johnny and Malcolm continued on the road whilst the others made the detour up to the top where the windy conditions made for a short stop. After that itwas downhill all the way with the party being reunited well before we returned to Mosset. Alan cooked up a fish pie plus accompaniments for the meal and a very convivial evening was had. N.B. Johnny retired at 9.15. Thought had been given to do the coastal walk but some were keen to watch the Australia v Wales rugby match so the coast was put off until the next day. Whilst the rugby was on another shopping trip was made and lunch was taken alfresco. 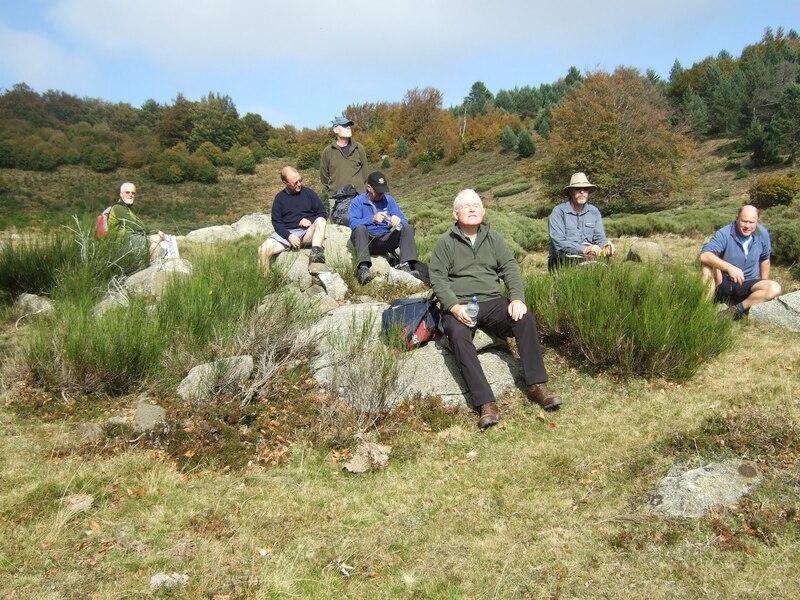 The weather was still beautiful despite the overnight fr ost when we set off along the canal heading for Molitg. We had intended having a beer at the cafe in High Moiltg but it was shut so we headed down to the Royal and enjoyed our beers there before setting off down past the Spa before climbing up to the top of the hill. 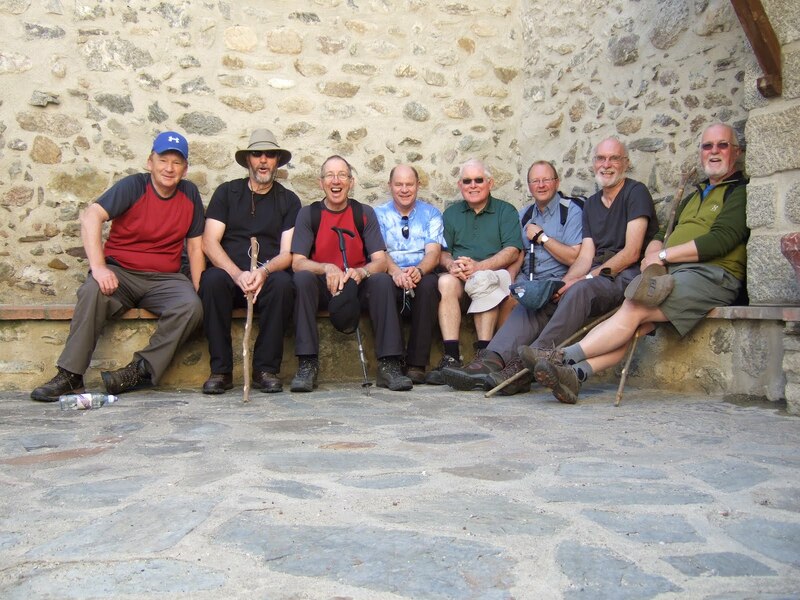 Here we had ample photo opportunities in the lovely afternoon sun before commencing the homeward leg. Here forward thinking on Robert's part paid off as the Doblo had already been parked on the road back to Mosset. Seven of us in a 2-3-2 formation piled into the car whilst Paul, he of the good sense (remember this was a 5-seater), decided to stride back to base camp. Rex's dish tonight was Pork in Hoi Sin sauce having carried the tin of sauce all the way to France from Possil - now there's dedication for you. The dominoes competition was won far too easily by Johnny and Allan after the teams had been decided by drawing lots. It must be stated that the previous joint winner failed to win any of his downs. Nae T-shirts this year then! 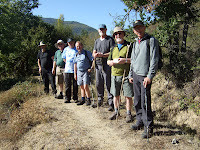 Another fine morning saw the group travelling to the usual starting point for this walk between Banyuls and Port V endres. 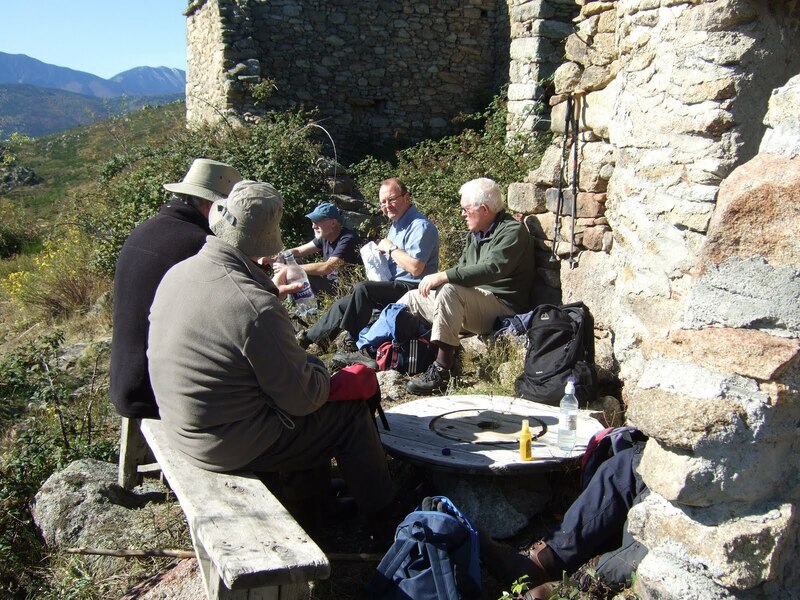 The weather had dulled over but by the time we reached the lighthouse at Cap Bear the sun had come out again and lunch was taken in our den before continuing along the road to Port Vendres where refreshments were taken in a quayside cafe. 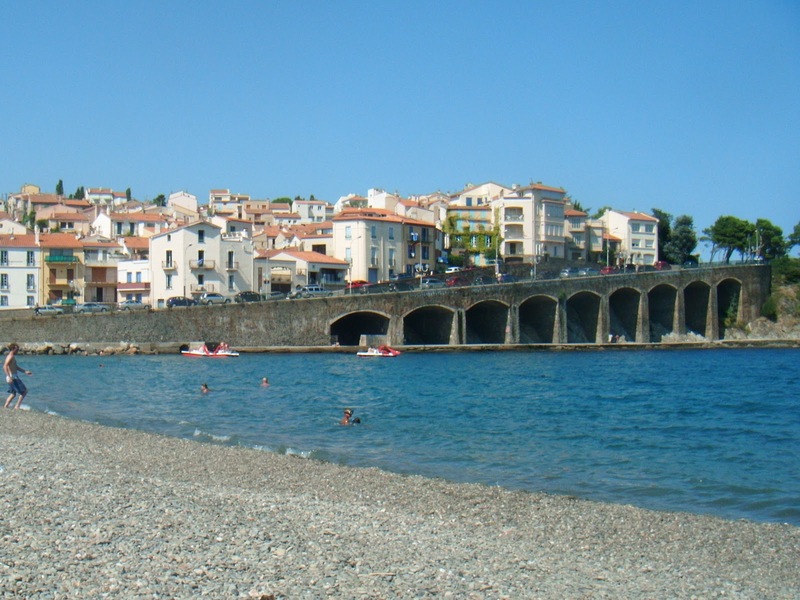 We then drove to Collioure to enable Malcolm and Davie to see this picturesque village. After a look around and being entertained by rowing races in the rather choppy harbour, we set off for home. For dinner we had booked in at the cafe in High Molidg. It hadn't been our first choice but since the Cafe Royal was not doing evening meals and the menu looked good Robert had taken the opportunty to book it. We set off in good spirits in the Doblo with Robert driving and this time the formation was 2-4-2. Unbeknown to us though, the choice was Tapas or Tapas. This suited most, but our resident I.T. expert was less than impressed. However, although different, we had a good night ending with Robert putting a bet on with the owner about the outcome of the Rugby World Cup Final. The formation on the return was a more-laid back 2-3-3, the ball players being in the boot. We settled down to watch the New Zealand v France game whilst Davie prepared the evening meal. Despite the pundits' predictions the home side just hung on for a narrow victory with France taki ng a lot of credit. Because of this Robert didn't have the Gaul to go and pick up his winnings - a free drink. 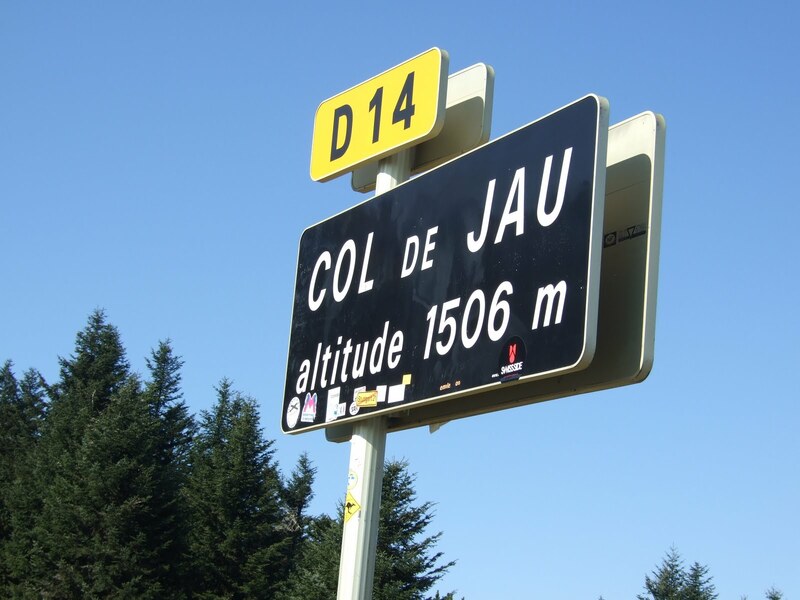 After lunch at the house we set off for a walk from the Col de Jau. This took us off to the right and as we passed two dead sheep in a pen we wondered what lay ahead. Maybe the circling eagles above had something to do with it. Q. What do you drink with a dead sheep? After an hour or so of following the track, it eventually ran out and, with the weather beginning to close in, a decision was made to return the way we had come. Paul, who had earlier informed us that, according to his GPS, we we re only 962 miles from the Hill of Stake (possibly the closest we will ever get to it) and Robert made a wee detour to try and find another path and when they emerged they were accompanied by a wee dug which followed them all the way back to the cars and looked longingly at us as we left it behind. Davie's Beef Wellington aka Mosset Pie went down a treat and since Johnny had retired early again and we were suffering withdrawal symptoms from his eloquence we compensated by listening to Kevin 'Bloody' Wilson. Another good night! Monday 24thThe forecast was dodgy, a day for cagoules? 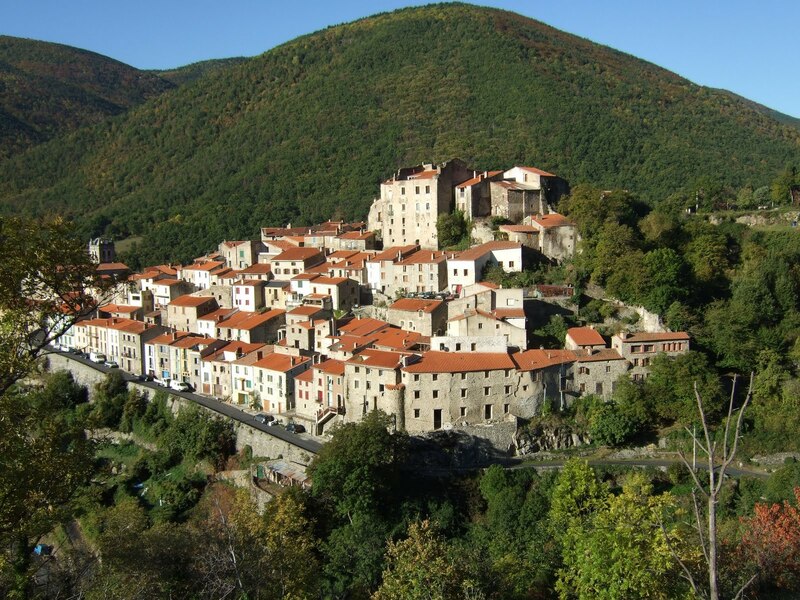 In anticipation of ra in we decide to play safe and travelled to Vernet Les Bains where we had a coffee before climbing up to L'Abbaye St Martin du Canigou. The weather was fine if a bit windy at the viewing point so we wasted no time in finding our way back to the carpark for lunch. 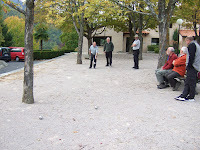 The annual boules tournament was held in Vernet and on a much better surface than last year. This allowed for some fine play with Rex, Alan and Paul reaching the final in which Rex was triumphant. Who is Ian Hill anyway? The day out had been much better than anticipated with only a couple of brief, light rain showers to contend with. Johnny was given special dispensation to return to the kitchen and he produced the goods by serving up soup and seafood risotto for dinner. 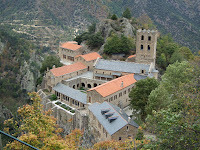 A beautiful morni n g greeted us for the trip to Prades market and a coffee in our favourite café. Various options had been suggested for today including a trip to the Col de Mantet and the walk up to Les Trois Etoiles but, with fatigue setting in, a low level walk was agreed. This started at the school in Prades and wound its way up the road to Llugols. Low level it might have been but it was uphill all the way affording terrific views back down the valley from Prades to Perpignan and over towards the Canigou. 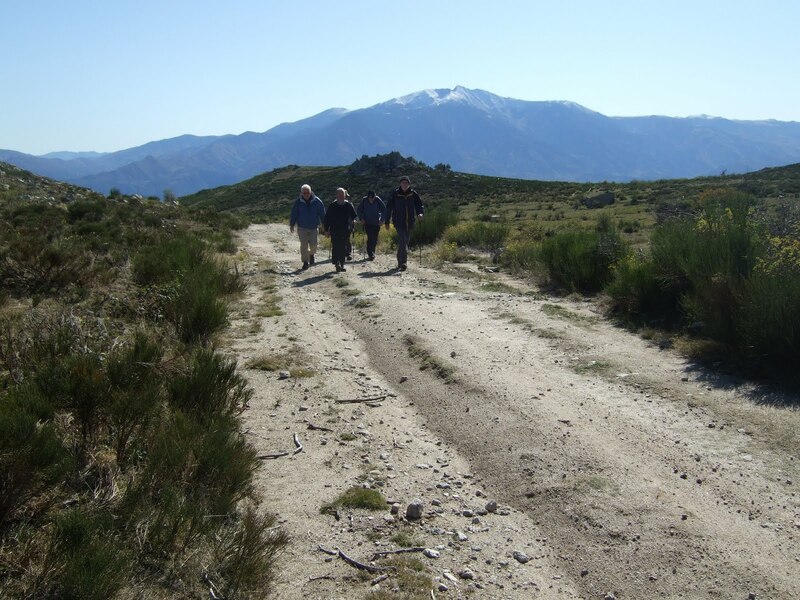 Having reached the hamlet (basically a few houses) Allan decided to go back down the way he had come up and was followed by Johnny and Malcolm whilst the remainder walked on down a donkey track to complete a circular route. Back at base camp, after the big tidy up, Johnny was allowed a reprise in the kitchen with another hearty soup and pork chops. The darts tournament was held in the evening and was won by Malcolm who beat Allan in the final. Thankfully we decided not to use the rules devised by Johnny (we'd still be playing yet) and went for a straight knock-out. Is Davie still drinking the Chimay beer? A 9 o'clock start saw us back at Girona in plenty of time for the flight back to Prestwick. . Thanks again to Robert for his hospitality and forbearance. Well done to the drivers, cooks and bottle washers. 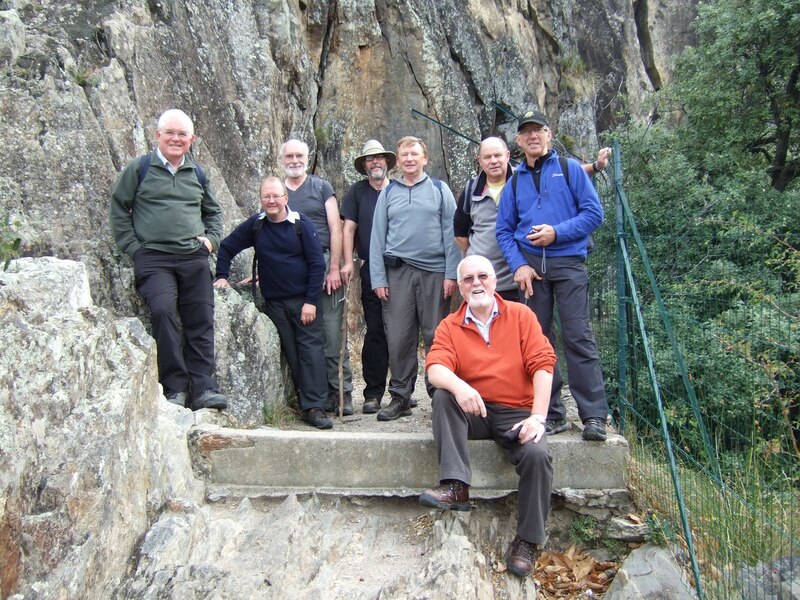 A special award to Davie for managing the walks where his vertigo was sorely tested. So it's back tae auld claes and purridge then! With the gang still missing for the reasons of last week, Jimmy and Peter with Peter’s friend John from Auchinleck took advantage of a bright morning to walk the Cumnock to Ochiltree walk, visit Dumfries House, have a a bite of peece in the old graveyard at Ochiltree and finish by walking through Auchinleck House estate to Catrine. 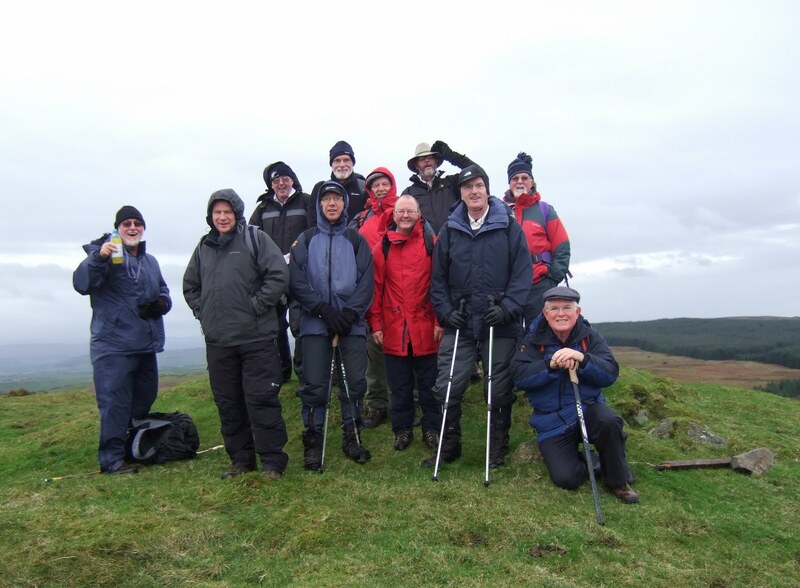 With most of the group jetting off to France for the annual trip and others otherwise occupied, only two turned out for this outing around Muirkirk. As we changed into walking gear in the car park at Kames a plane was heard flying south and we suspected this was the flight carrying the boys to the sun of southern France. Had the weather been as it has been for the last week - pouring rain flooding the countryside - we might have felt a twinge of jealousy. As it was, the day dawned bright and sunny and, given the northerly airstream, we anticipated that this would be the pattern of the day; there was only a fleeting moment of regret as we heard the plane fly south into the morning sun. The northerly wind was cool but when we were sheltered from this the sun was pleasantly warm, warm enough for Davie to start the day in shorts and for Jimmy to set off jacketless. This was the way it was to stay for the rest of the day. The walk itself was to be the same circuit as we have done before (7/7/2010 & 29/6/2011) so we set off south-westward behind Kames towards Tibbie’s Brig on the River Ayr Way. 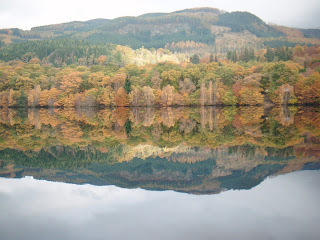 This was to be a more relaxed walk than we are used to for Jimmy had his camera with him and Davie had the patience to wait while he photographed anything from Tibbie’s Brig to sunlight on the autumn leaves and the coos in the fields. 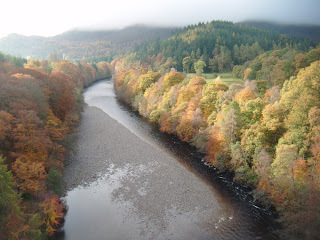 And in this relaxed mood we came down the River Ayr Way to the Cumnock road. Birdlife was abundant on this section today: kestrels hunted over the moor around Tibbie's Brig, finches kept us amused along the old railway and a flock of around two hundred fieldfare fed in a field near Wellwood. We took time to watch the birds today. Unusually, considering the bright morning, we never met a soul on the ‘Way’ today. The first person that we saw was a fisher preparing to catch lunch at Dalfram Bridge. We wished him success and walked on up the minor toad to Dalfram, crossed the Sorn road and continued towards Netherwood. Jimmy’s camera was in action again when he saw the unusual herd in the field; horse six cows and a single sheep. When Jimmy stopped by the roadside, the herd/flock came running towards him affording plenty of opportunity for the camera. Davie waited patiently while all this took place. Then, with the prize winner in the bag, we walked on. We left tarmac at Burnfoot and came down to the side of the Netherwood Burn. On the bridge here we stopped for a bite to eat. We found the wet bit just over the bridge, where the old track degenerates before it joins the forest road but then what could we expect after the rains of the last month. But we managed to pick our way over the wet muck to join the forest road and followed this round to the remains of the old open-cast works. If we thought that the road was wet earlier, we were in for a shock now for the wee wild-life pond created here was filled to overflowing with the previous rains, overflowing right across the road we had to travel. And ten inches deep in places. We had to make a diversion round the only comparatively drier area to the west. At least Holly enjoyed the paddle. Back on terra firma we followed the road out to the Stra’ven road, crossed this and too the Tardoes Road to the kirk. There are a few interesting old stones in this graveyard. Buried here are Tibbie Pagan, John Lapraik, the Rev. 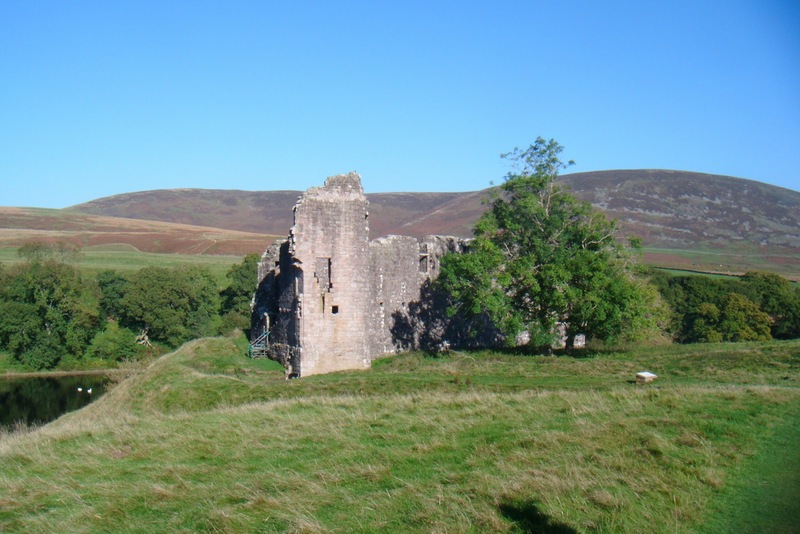 John Shepherd (Muirland Jock in Burns’s ‘Kirk’s Alarm’) and the covenanter John Smith but the most intriguing stone must be that to the two children killed by a wildcat. We spent some time in the old graveyard, wandering around in the sun, even taking time to look at the covenanter’s monument retrieved from the old Glenbuck church before it was swallowed up by the open-cast. But time was moving on and we moved on as well. From the churchyard we made our way back on to the River Ayr Way by way of Auldhouseburn road. Twenty minutes saw us back along the ‘Way’ to Kames and the end of the walk. The Coachhouse provided FRT for the day before we made our separate ways home. 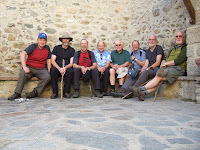 Nine Ooters (Robert, Johnny, Allan, Ian, Macolm, Rex, Paul, Davie x 2) gathered at Allan's for scones and coffee and to make a decision on the day's walk. 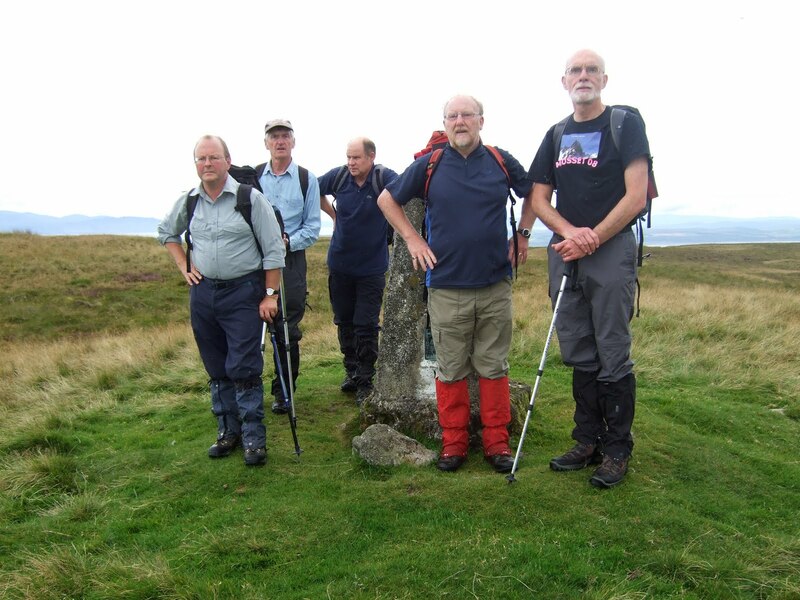 The original plan to walk from Largs to the Hill of Stake had been more or less ruled out for fear of it becoming another Black Craig walk. Muirshiel to the near-mythical hill was the proposed alternative, but the day had dawned grey with low cloud, and after a vote(!!!) the decision was taken to go to Cumbrae instead. The vote had been 5-4 in favour of Cumbrae .... but the waters were then muddied when Allan tried to switch his vote from Cumbrae to Hill of Stake (Allan doesn't often vote for anything with "hill" in it) but his intervention was deemed ultra vires. At this point Robert opined that what we needed was a "benevolent dictator". A few nodded sagely, but all opined that, by definition, Robert would obviously be ruled out from holding such a position. Rather than the two men and a dog we expected to be waiting for the Cumbrae ferry, the slipway area was mobbed with scores of university students (budding biologists going to cut up fish) waiting to board the ferry. Strangely they were all lined up in twos, with a few holding hands. Whatever happened to the student anarchists of yesteryear? Some of the Ooters chose to line up behind the students, not holding hands so far as could be seen, whilst the erstwhile anarchists just stood at the top of the slipway, and consequently got the best seats. At the Water Sports Centre we were to leave the road around the island and cut overland towards the Glaidstone road. There was a track. We climbed to the top of Broomy Knowes (89 metres asl) but then the rains which had fallen in recent days all seemed to have accumulated on the path below Broomy Knowes and we had to pick our way around deep puddles and clawing red mud to get back to tarmac. Some were more successful than others in avoiding the perils of the track. In the best traditions of the Ooters, Ian got pelters. However, his retort that he had voted to go to the Hill of Stake soon silenced the critics. Morning coffee was taken at the usual spot, atop the Glaidstone, now embellished with several new seats. The rain which had stayed off so far now put in an appearance, but it was no worse than light drizzle. It transpired that Ian didn't have his waterproof jacket with him, but using the skills he no doubt learned in the BBs he created a fetching little black number out of a bin liner he had with him. Millport resembled a ghost town with hardly anyone out and about. We decided to call in at the golf club for a refreshment but we were thwarted in our ambitions. Like Millport, it was shut. We headed off through the fields to Fintray Bay where lunch was taken at the picnic tables by the shore. Today very few cyclists were out on the road, and cars were pretty infrequent too. The walk ended, naturally, with a race to the ferry terminal. 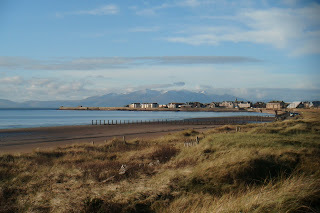 FRT was taken at the Laurieston in Ardrossan. This was a pleasant and relatively leisurely day out ... and we still have the Hill of Stake to look forward to! 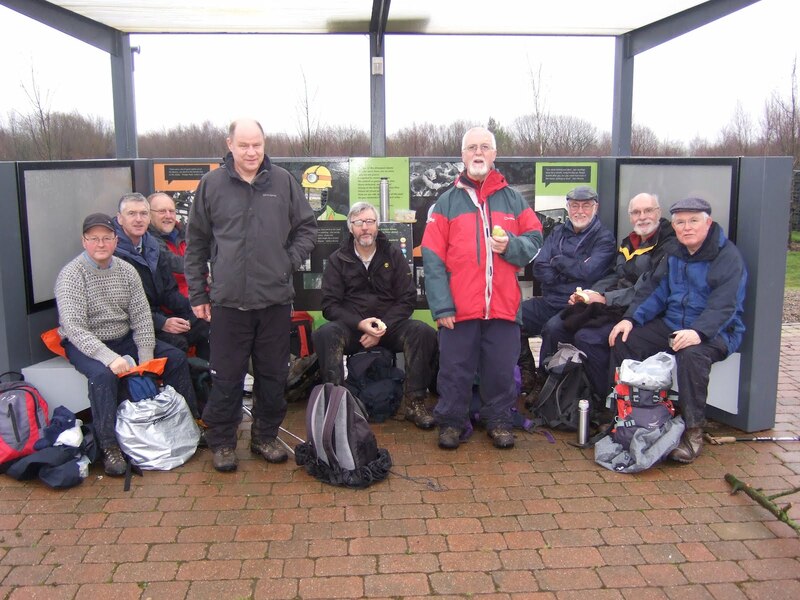 Six Ooters met at West Kilbride Railway Station at 9.30 on a dry, warm but overcast morning to start the walk to Largs via Blaeloch Hill and down through Kelburn Estate. The route was well documented when we did this walk for the f irst time on 28 April 2010 so mention here will be made of the big change to the landscape that has taken place over the last 15 months, namely, the groundworks and accompanying road network that have been insta lled in order to construct yet another windfarm . The view from Blaeloch Hill inland towards Dalry and Kilbirnie is now dominated by the aforementioned works but, on the positive side, it meant that another group of walkers, the West Kilbride Ramblers, had an easier walk up to the hill from Dalry as they now could follow a road for a fair part of the way. Lunch was spent blethering to our new friends. Our descent tow ards Kelburn was also made easier for part of the way as we joined the access road for half a mile or so until we turned off towards the burn and the path into the estate before descending to the bus stop at the foot of Haylie Brae. Fortunately we did not have long to wait and we were soon heading back to West Kilbride but as we passed through Fairlie we stopped to pick up the WK Ramblers who had made their way down via Fairlie Glen. 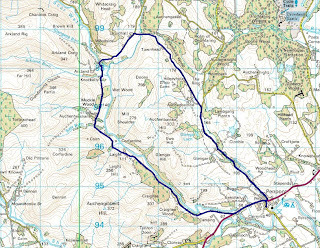 This was a good walk (5 and a bit hours) with only one really boggy part to contend with despite the rain that had fallen on previous days. FRT was taken at the Lauriston in Ardrossan.